On May 1, the Department of Transportation issued new regulations requiring railroad cars that transport crude oil to meet a new safety standard. The rules will require rail companies to, among other things, stop using the most at risk rail cars by 2018. Safety groups and members of Congress have been calling on the Department to issue new rules for years. Several members of Congress have said that the new regulations are still not strong enough. Meanwhile, railroads and oil companies have said the new rules will hamper their industries. The two industries have contributed heavily to the congressional subcommittees that oversee the regulation of railroads and that are responsible for legislation relating to the safety of crude oil trains. Campaign Contributions Data: A MapLight analysis of campaign contributions to the principal campaign committees of members of Congress from the political action committees (PACs) of the Association of American Railroads and Class I Railroad companies(BNSF, CSX Transportation, Kansas City Southern, Norfolk Southern, and Union Pacific); the American Petroleum Institute, and the top five oil companies (BP America, Chevron U.S.A., ExxonMobil, Occidental Petroleum, and Shell Oil Company) that lobbied about “crude by rail” during the first quarter of 2015. Contributions data source: Federal Election Commission. Lobbying data source: Clerk of the U.S. House of Representatives. 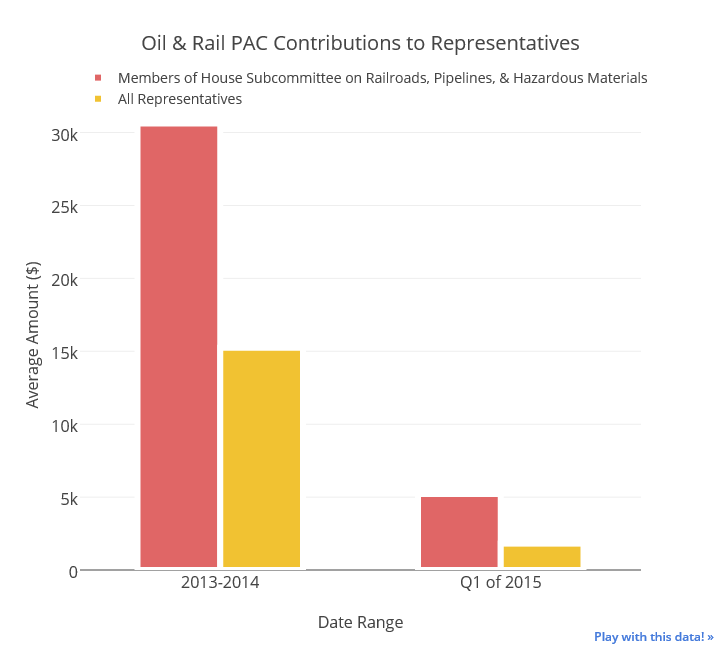 The PACs of the top railroad and oil companies, as well as their trade associations, contributed, on average, 2 times more money ($30,621) to members of the House Subcommittee on Railroads, Pipelines, and Hazardous Materials compared to the average member of the House ($15,244) during the 2014 election cycle (January 1, 2013 – December 31, 2014). During the first quarter of 2015 (January 1, 2015 – March 31, 2015), the PACs of the top railroad and oil companies, as well as their trade associations, contributed, on average, 2.9 times more money ($5,210) to members of the House Subcommittee on Railroads, Pipelines, and Hazardous Materials compared to the average member of the House ($1,808) . The PACs of the top railroad and oil companies, as well as their trade associations, contributed, on average, about the same amount ($19,000) to members of the Senate Subcommittee on Surface Transportation and Merchant Marine Infrastructure, Safety and Security compared to the average member of the Senate ($18,868) during the 2014 election cycle (January 1, 2013 – December 31, 2014). During the first quarter of 2015 (January 1, 2015 – March 31, 2015), the PACs of the top railroad and oil companies, as well as their trade associations, contributed, on average, 1.8 times more money ($3,118) to members of the Senate Subcommittee on Surface Transportation and Merchant Marine Infrastructure, Safety and Security compared to the average member of the Senate ($1,740). Campaign Contributions Methodology: MapLight analysis of campaign contributions to the principal campaign committees of members of Congress from the political action committees of the Association of American Railroads and Class I Railroad companies (BNSF, CSX Transportation, Kansas City Southern, Norfolk Southern, and Union Pacific); the American Petroleum Institute, and the top five oil companies (BP America, Chevron U.S.A., ExxonMobil, Occidental Petroleum, and Shell Oil Company) that lobbied about “crude by rail” during the first quarter of 2015 from recently available FEC data from January 1, 2013 – March 31, 2015.